« How do I get an alarm from our station that’s 17 miles from here? Are bubbler systems still viable for measuring liquid level? Since Lesman started focusing on level instrumentation 15 years ago, we’ve seen a lot of change. High-tech solutions bring higher accuracy, the ability to automatically eliminate tank obstructions for fewer false readings, the ability to measure level in almost any medium, and even send data from remote tank level systems to a control room miles away. So is there still a need for more traditional, pneumatic systems, like air bubblers? Absolutely! And why? Because there are still applications where DP, capacitance, ultrasonic, and radar level systems just won’t work. What is a bubbler system? An air bubbler system uses a tube with an opening below the surface of the liquid level. 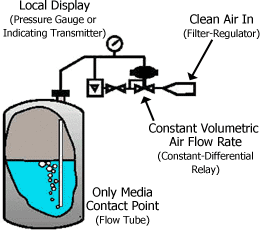 A constant low flow of clean, dry air is passed through the tube by a filter-regulator. A constant-differential relay (regulator) maintains constant air flow under the varying head pressure of the liquid, and eliminates the effects of variations in the plant air supply. A pressure transducer or transmitter monitors the tube’s back pressure, which is representative of the level head pressure. Any change in the liquid’s level corresponds to an equivalent change in the back pressure inside the tube. Digital pressure transmitters can also serve to provide local level indication. Why use a bubbler for liquid level? Because the only part of the bubbler that touches media is the air flow tube, it can be used for applications where you don’t want the liquid to contact a sensor. Plus, since the tube has no moving parts, bubblers are well-suited to measuring sewage, sludge, drainage water, or water with large quantities of suspended solids. And because the point of measurement has no electrical components, bubblers will work in hazardous areas. Since bubblers can be used in small diameter pipes, they can allow for installations in tanks where other systems won’t fit. Most importantly, where capacitance, ultrasonics, and radar level systems will fail when there’s foam on the surface of your liquid tank, a level bubbler will work. It also works reliably in the presence of vapors, and, unlike ultrasonics, can be used in media temperatures of more than 350°F. Bubblers are normally used in applications where foam, solid debris, sewage sludge, or turbulence make ultrasonic, radar, or float switch devices ineffective. Every level technology has its disadvantages, and the bubbler is no exception. But proper maintenance and attention to the system can keep it performing for a long time. The tip of the flow pipe can collect material from the process, which solidifies and plugs the hole. In cold environments and weather, moisture freezing in the air supply can cause the regulator to fail. Bubbler system accuracy is dependent on a constant supply of clean instrument air, so if the air isn’t clean, the regulator will clog more frequently. (It’s not a matter of IF, it’s a matter of WHEN.) This means more regular maintenance, which brings a higher cost, even though the installation costs can be fairly low. Plus, since the accuracy is limited by the regulator, accuracy can vary by as much as 10% of full scale. The need for system calibration is directly affected by changes in media density. So, if your medium is prone to change, your calibration time will increase. To avoid overfills, remember to calibrate at maximum temperature. Sure, it’s an older technology, but the air bubbler is still viable for liquid level applications. Look here to learn more about liquid level bubbler systems. Is a bubbler the right technology for you? If you’ve tried more advanced technologies in the past, you may want to consider them again. We’ve seen lots of improvements in ultrasonics and radar, for instance, since they were first released, making them work in applications where they couldn’t before. Check here for a comparison of level technologies and their strengths and weaknesses. This entry was posted on January 4, 2012, 11:43 am and is filed under Air Bubbler, Level, Level Technology, Siemens. You can follow any responses to this entry through RSS 2.0. You can leave a response, or trackback from your own site. If the tank vent is blocked in, would the air need to be relieved through a pressure relief device?